It is Monday…and while this is usually not my most favorite day of the week, I absolutely LOVE today because it is the first day of Spring Break! Ah, the possibilities that lie ahead and what appears to be great amounts of free time to do whatever I choose. Of course, I know this week will fly by and I will not accomplish all that I hope, as I do have quite a few bookish activities planned. I did not participate in The Sunday Salon this week because I was simply too absorbed in Jodi Picoult’s newest book, House Rules (and if you are interested in winning an autographed copy – click here). 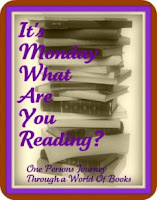 So…I thought I would participate in Sheila’s Monday morning meme instead; I plan to read A LOT!! Ok — so I am setting myself up for disappointment, as there is no way any human being can accomplish all that I have outlined here. However, I will sure have a great time trying to do as much as I possibly can. Hope y’all have a great week as well….. Enjoy your Spring break whatever you choose to do! I just read Shutter Island. I loved it! What a mind bender! Have a fabulous Spring Break. I hope you accomplish all that you have set out to do. Loved Becoming Jane Eyre and The Man who loved books too much. I need to get Shutter Island. I've heard great things! Shutter Island on audio rocked my world. My review is coming tomorrow. Isn't it exciting to have a whole week ahead of you, to get caught up and read all you want??? We've got ours the first week of April, but I sincerely doubt I'm going to get anything done with the kids at home. Still, a week without homework, sports practices and other stuff is a vacation all by itself! What an excellent list of books! I really want to read Shutter Island! Well, you have succeeded in getting "You Can't Stop the Beat" thoroughly stuck in my head, just with the reference of "motion of the ocean" reference. At least I like the song… So you're liking the Jodi Piccoult book? I had it on hold, and then took it off, because the subject matter just kind of left me cold. Plus — do you find her at all hard to read, waht with the constant changing of points of view? Then I remember how much I loved "My Sister's Keeper," and I re-think my opposition. We'll see, I guess. I'm nearly done with "Split Image," by Robert Parker. What a fast read, and I find myself thinking, what with Parker's death, that this might be the end of these characters. (The main ones, I mean.) And that saddens me. I also have discovered a great coffee table book, "PersonaliTrees," by Joan Klostermann-Ketels. Wonderful book of photos of trees depicting human emotions and conditions, each matched with an inspirational quotation. It's restful — which is certainly a change from how most of us live our lives. And you start looking at individual trees again, looking for the traits that set one apart from another. And to me, at least, it makes me look more closely at the people in my life and what sets THEM apart, makes them unique and enriches my life. I so want to read Alice In Wonderland, The Cotton Queen (I love Pam Morsi! ), Fabelhaven (cant wait to read this! ), Still ALice, and House Rules! Enjoy the break!!!! And I am interested in reading the latest Jodi Picoult book. .. I'll be joining in! I just love the process of making lists and trying to see what I can accomplish from them. Enjoy your week and your reading! Enjoy your spring break! I'm sure the time will fly by. So you may not be able to accomplish everything on your list though I'm sure it's going to be fun trying to! Have a great spring break! Becoming Jane Eyre looks really good. Enjoy your reading this week! You sound so happy in this post. I hope this week turns out to be all you hope for. I totally loved Frankenstein when I read it way back when! I also have The Postmistress on my TBR and have heard very good things about it! Molly…I got tired and overwhelmed just reading all you hope to accomplish on this list. Good luck MS. Ambitious! Molly I will be looking out for what you have to say about Shutter Island. Sometimes it is not a favorite Lehane book so I am always curious to see the different opinions. You've got a lot on your plate! When do you start all of the heavy reading?! Have a wonderful spring break. It sounds like you have plenty to keep you busy!